Very friendly and helpful staff, very comfortable bed, spectacular view from the open 10th floor bar, very good breakfast (perhaps overpriced a bit). Going down to parking level exit takes you right away to the old Lisbon, with two restaurants literally 50 m away., Hotel gives a very good vibe. Where to find Porto hotels near an airport? How can I find hotels in different Porto neighborhoods? Where can I find hotels in Porto that are near tourist attractions? You can discover an extensive range of accommodation choices in Porto. Spend some time looking through Expedia's 165 hotel listings, which are all within a 0.1-kilometre (0.1-mile) radius of Porto's center. Travelers searching for a great place to stay not far from the center of Porto, should check out the InterContinental Porto - Palacio das Cardosas and Hotel Teatro. Antas offers 2 establishments which makes it the part of Porto with the most hotels. It lies 2 kilometres (1 mile) from downtown. 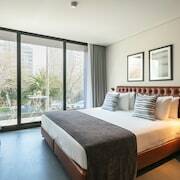 Antas places to stay include the AC Hotel Porto by Marriott and Porto Antas Hotel. 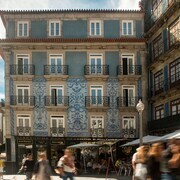 Rua de Santa Catarina, Boavista and Aliados are three other Porto neighborhoods that offer Expedia-listed hotels. If you opt to reserve a room in Rua de Santa Catarina, choose from the Grande Hotel do Porto and Hotel Seculo. Alternatively, those who prefer to base themselves in Boavista can choose from the Porto Palacio Congress Hotel & Spa and Casa do Conto. 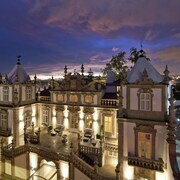 In Aliados, choose from the InterContinental Porto - Palacio das Cardosas and Hotel Teatro. No visit to Porto would be complete if you don't take a trip to the Sandeman Cellars. The Yeatman Hotel and Pestana PalÃ¡cio do Freixo - Pousada & National Monument, are handy options for travelers as they are within walking distance of the Sandeman Cellars. If you plan to book a hotel close to Casa da Musica, Porto Cathedral and the Museum of Port Wine, there are a number of options. Places to stay that are near Casa da Musica include the Pestana Vintage Porto - Hotel & World Heritage Site and the Hotel Infante Sagres. 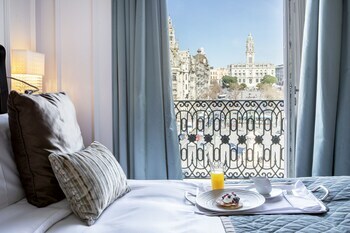 While the Pestana Vintage Porto - Hotel & World Heritage Site is 3 kilometres (2 miles) from Casa da Musica, the Hotel Infante Sagres is 3 kilometres (2 miles) away. The Cale Guest House and the Hotel Carris Porto Ribeira are situated an easy walking distance from Porto Cathedral. However, the Sheraton Porto Hotel & Spa and also the Crowne Plaza Porto are convenient if you'd like to stay near the Museum of Port Wine. 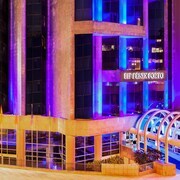 The Sheraton Porto Hotel & Spa is only 2 kilometres (1 mile) away and the Crowne Plaza Porto is 2 kilometres (1 mile) away. The Porta Azul Guest House and Vila GalÃ© Porto are nearest to the University of Porto, and the Eurostars das Artes and Holiday Inn Porto Gaia are within walking distance of Church of Sao Francisco.â€¨ Those who are traveling to Porto for Dom Luis I Bridge could look at staying at the 6Only Guest House and Cosme Guesthouse. Finally, if your focus is on Crystal Palace Gardens, your closest hotel options are the BessaHotel Boavista and Mercure Porto Centro Hotel. Dr. Francisco de Sa Carneiro Airport can be found 11 kilometres (7 miles) away from Porto. Visitors who choose to stay nearby, you can easily book a room at the Holiday Inn Express Porto - Exponor or the Park Hotel Porto Aeroporto. 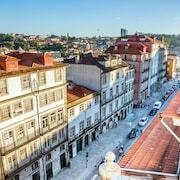 What are the most popular Porto hotels? Are there hotels in other cities near Porto? What other types of accommodations are available in Porto? Explore Porto with Expedia.ca’s Travel Guides to find the best flights, cars, holiday packages and more!